I had previously posted this, http://www.quiltingboard.com/main-f1...e-t225027.html. I decided to try all the suggested stitches. Ladder Stitch, (which I had been doing, and is done for all the purple), overcast, and running stitches. The overcast totally showed up on the front, the ladder and running stitch didn't show up too much. The problem I'm finidng I'm running into is that no matter what stitch I'm doing, the thread totally shows in the corners. I've watched videos, read tutorials, and don't know why this is happening. It seems that I'm following the directions, but obviously I'm missing something. Incedentally, I'm using the light thread on purpose on this practice project so I can see where I might make mistakes. And the light thread has not let me down! haha! Oh and starching made a HUGE difference. I actually think I'll starch each hexie before attaching them. Thanks again all! I am definitely loving the hexies!! Your thread will always show unless using a thread to match the colour of the fabric.I think your stitching looks great anyway.I have basted through the papers with success but the papers dont last long. I used a overcast stitch. Even used a black thread for the whole project. I see my stitches but from a distance you see nothing of it at all. Use the stitch you like and enjoy your project. I always use a sma ll ladder stitch. The corners if you look carefully some are not exactly pointed using your needle just tweak out a little and give a pull not too tight then see the result. your stitches look fine & when you switch to thread color that matches you will not see those corner/point areas that you see now, when the quilt is finished, quilted & bound the stitches will not really be noticeable unless you take a magnifying glass to it & people looking at quilts seldom look that closely- give yourself a break. as for stitching through the paper...if you have mastered basting without why start? when you sew through the paper you have to remove the basting stitches in order to remove the papers & the papers do wear out faster- when you fold fabric over & baste without sewing through the paper the basting stitches can stay in- they are not noticeable on the front- and removing the papers is an easy task- without damaging- except a little bending- they are easy to straighten out for reuse. I've never really understood why anyone would stitch through the papers- seems like so much more work than necessary. Your stitches look fine and unless you are two inches from the quilt (lol) you will not see them. It is almost impossible to keep all stitches from being visible on the front when hand stitching GFG. I'm thinking perhaps you are going just a bit deep with your overcast stitch. I use the same color thread for all my EPP, and it does not show thru. Besides, in your case, you have to use either black or pink. Will show on one of the other unless your stitches are smaller. You wouldn't use a running stitch with EPP. That is done without the papers. When basting to the papers, I use one fairly large stitch on each side. Double stitch at the "corners" When I remove the papers, I do not have to remove the basting. I clip that one stitch from the front, turn it over and pop out the paper from the back. That brings the thread to the back. That one stitch stableizes the fabric, and keeps the papers in until I want them removed. I use a light color thread for basting and overcasting. My fabric is usually starched before cutting, but I don't starch after, nor do I press each basted hex. Just take your time. and it will get better with every stitch your take. Good luck, and have fun with your project. I agree that yours is looking great. My preferred stitch is the running stitch with a back stitch at intersections. Have not yet done the GFG but it is in the works. I'm in the middle of GFG and I am confused as to how on earth one would baste and not baste through the paper. 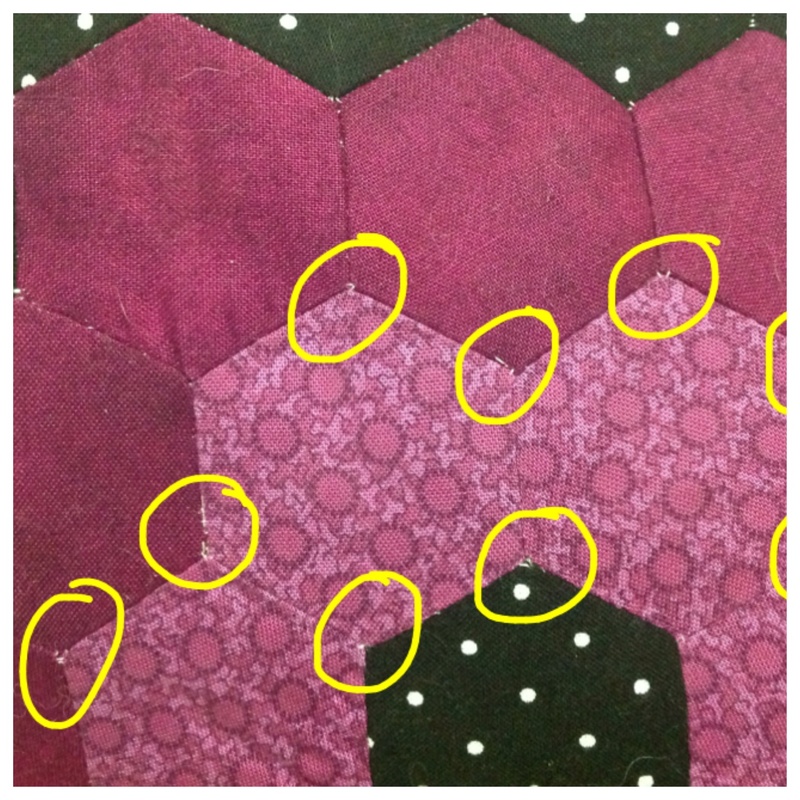 I actually glue baste my hexies, and find it much easier and faster than thread basing. I try to get the glue more on the paper than on the fabric. I use a Sewline glue pen. Some people just tack from corner to corner, letting the basting thread travel on top of the fabric, no stitches in between the corner tacks. Not my prefered way, but what ever works. I have not tired glue, but plan to at some point. I use freezer paper for my hexes. 2000 of them! It's a big quilt and taking several years. I iron the paper to the back of the fabric, cut leaving 1/4" and then I baste the edges down and leave them until the quilt is finished. I don't like floppy stuff and this keeps it looking great and holding together until I get the top finished. I had some sent to me by a European quilter. they were so tiny I almost couldn't see them. overcast I think. nothing showed on the front. 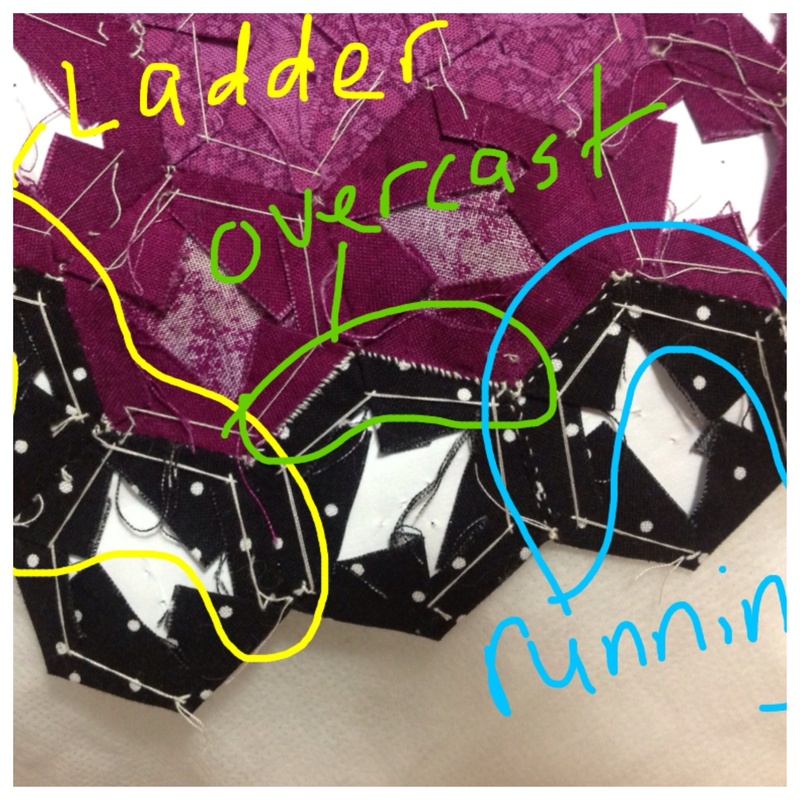 I would suggest taking a smaller bite of fabric when doing either ladder or whip stitches (a couple threads on each piece) and make two stitches at both ends of hexies -- beginning and ending. I use thread matching the darkest color, but you will have to do this on trial and error to see what works best for you. As far as basting my papers I baste through the paper because I can't seem to get the fabric tight enough around the paper if I don't. I use Paper Pieces papers and am able to use them multiple times. Baste the method that works best for you. I also find that if my fabric isn't tight around the paper I take larger bites of the fabric when I'm stitching. I like your stitches and I agree with the others that when you use a matching thread it is so much less noticeable. I have the pattern for GFM (took a while to figure out what this stands for, brain cramping today I guess). And it uses a overcast stitch, but I also like the running stitch. I have bought plastic templates that come in a pack of 100 I think, and reproduction 20s and 30s fabrics to do mine. I got the plastic templates so I can baste and iron the pieces. Hmmm.....need to get it out and start working on it. I already have two hand projects going and several other UFOs, what's one more! LOL! Keep going and don't be afraid. We learn by doing and the board is always here to help! You guys are great. Im so glas Im doing this practice piece. Ill try some of the suggestions and Ill go ahead and try some black thread just to try it. I couldn't see your ladder stitches at all, even in the close-up. It was the answer for me. My GFG is going so much better now.